I typically buy regular ground coffee beans to brew at home. Yesterday at the grocery store, I discovered EVERY flavor of coffee imaginable! Blueberry, butter toffee, vanilla crème... You name it, they had it. I checked the ingredients: coffee beans and natural and artificial flavors. But what about calories? Please help a coffee-lovin' sista out! I have good news! When it comes to ground coffee and coffee beans that you brew yourself, pretty much every kind out there is virtually calorie-free, especially if there are no nutritionals listed on the bag (that's usually an indication that the stats are negligible). So go wild and try 'em all. I really love the kinds by Millstone, and there's a company called Boca Java that makes crazy flavors like chocolate cherry and bananas Foster. You do need to watch out for flavored instant coffee, the kind you dissolve in hot water. It's sometimes sweetened and can have as much as 100 calories a serving. As for flavored coffee you order at a restaurant or coffee shop, this stuff isn't necessarily guilt-free -- there's a chance that the flavor comes from sugary syrup added after the coffee is brewed, and that can add a lot of calories. So you have to ask if the coffee is flavored with syrup; if it is, see if sugar-free syrup is available -- many places have it, and that stuff is calorie-free. And one last thing: Keep in mind that even if you start with calorie-free coffee, things like creamer, sugar, and whipped cream can really cause calorie counts to skyrocket. 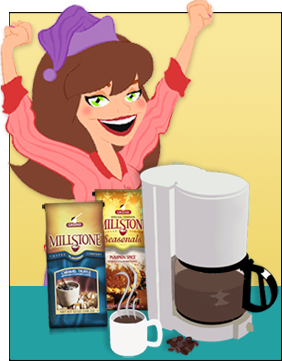 Click here for a whole bunch of guilt-free coffee tips! P.S. For DIY flavored coffee at home, add a sprinkle of pumpkin pie spice or cinnamon to the grounds before you brew. Happy sipping! 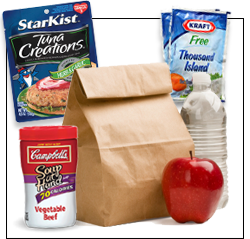 I need some ideas for guilt-free lunches that don't need to be kept refrigerated or frozen -- stuff I can fit in my backpack and eat in between classes. There is a microwave in the dining center, but I don't want to eat microwave meals all the time. Help! Pouches of salmon or tuna packed in water are perfect for backpack lunches -- there's no can opener or draining required. You can even find some that come pre-seasoned, like the Tuna Creations line from StarKist. Just remember to pack a fork! You can eat these on their own, or pile 'em on top of rice cakes or large high-fiber crackers. Filling and easy! Microwave-ready containers of soup are a great option -- satisfying and delicious. Progresso makes some fantastic ones, and the Campbell's Soup at Hand line is made for portable eating. Just check the stats for the low-fat varieties. Also look for microwave-ready containers of chili -- perfect for wrapping in a high-fiber tortilla (pack the tortilla separately, and assemble at lunchtime). All of these things would be great paired with a basic salad (no dressing, croutons, or cheese) from the dining center or a drive-thru. Stash a few single-serving packets of light or fat-free dressing in your backpack -- click here for a very cool site that sells them. If you're really in a hurry and don't have time for any assembly, try putting together a makeshift lunch of filling snacks: a stick of light string cheese or a Mini Babybel Light, a 100-calorie pack of nuts, some jerky, and a piece of fruit. Click here for a slew of emergency snack ideas. BTW, you may want to consider investing in an insulated lunch tote -- there are some really cute ones out there, and it'll expand your on-the-go lunch options BIGTIME. Good luck with the guilt-free eating and your studies!